A Content Management System (CMS) allows you to manage the content on your website the way you want. Choose Source Soft Solutions as your CMS web development company and increase profitability, revolutionize customer service and reduce overhead costs. Our impeccable range of customized eCommerce CMS development services include custom module development, theme development, check-out page designing, payment gateway integration and more on a well-designed responsive website. Start-up or established, large or small, simple or complex, we can customize CMS and eCommerce solutions to help you improve your business ROI. Our eCommerce and CMS developers have expertise in OpenCart, Shopify, Magento, Drupal, Wordpress, Joomla, AspDotNet, and DotNetNuke that enable them to create experiential solutions for you & give the audience a real feel of what the brand stands for. 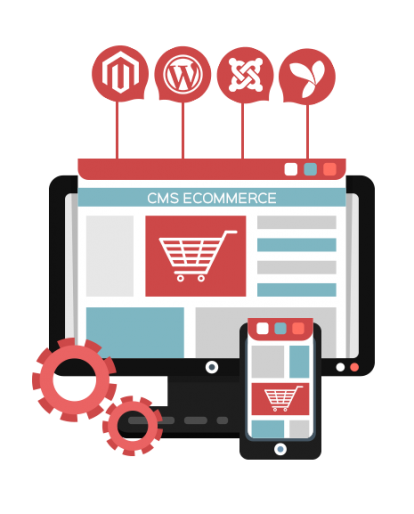 Source Soft Solutions is a custom CMS development company that has provided CMS web development services to eCommerce clients globally across various domains. We implement eCommerce solutions that help you communicate in real time with your customers, promote products and services and handle all business transactions effectively. Our high-quality open source eCommerce CMS web development gives you more control over your online store. Our designed eCommerce CMS is easy to use and maintain for your employees. Our proficient developers have years of experience in developing ideal eCommerce websites which are both reliable and efficient. We help eCommerce websites receive the recognition it deserves while making updates to the site as and when required. You can rely on us from start to finish and post-deployment maintenance. Why Hire Source Soft For eCommerce CMS Development Services? Being a leading custom CMS development company, we provide flexible engagement models to meet the diverse requirements of our various clients. We follow agile CMS development process in order to make sure timely delivery to our clients. On the basis of your project requirements, our team suggests you the best engagement models, estimated timeline and cost for our development services. Our customized services are sure to make your eCommerce shine in the online world and outrank your competitors. Have a glance at the range of the brilliant CMS solutions delivered by us. We have the team to work for you! Give us a call to discuss your project!